The Vertical Surfboard Rack is an attractive and efficient way to store lots of surfboards vertically. If you are looking to store your boards like they do in surf shops, this is it. The vertical storage makes it easy to fit a lot of boards in a small space. If you're limited in the amount of horizontal space you have to put your surfboards, then we highly recommend this rack because even the 6-board version only occupies 51" of space! Each rack comes with 16" long arms with 3/4" padding that will prevent your boards from slipping out and won't ding or dent your boards. We offer this rack in a variety of sizes from 2 boards to 6 boards. Customize to fit your exact storage needs. Can I use this storage rack for my (2) Stand-up Paddle Boards? This vertical surfboard rack does not have long enough, or strong enough, arms to support your stand-up paddle boards, so it would not work for them. For storing more than one SUP vertically, this rack here, is a possible option. It is usuallyfor horizontal use, but can be set up to hold them vertical, if you set it up sideways. One thing to note, is SUPs can be pretty tall, so when storing vertical, you would need to have adequate ceiling space. I usually put 2 boards in a bag and would like the bag to fit between the rack arms, so I'm wondering if a bag with 2 boards would fit (essentially fitting 2 boards in between each arm). There is 8 inches of space between each arm, which might be cutting it close for two boards in a bag, depending on the particular boards & bag -- but if they measures less than 8" total, you should be able to store your boards that way on this rack. Is this rack effective for longboards ? We have about six 9ft+ boards. This surfboard rack will be fine for your 9 foot or larger longboards. The only issue you might have, would be how tall your ceiling is -- if you can stand your boards up in the room you would be using the rack, you shouldn't have a problem. Can I use this rack for my Windsurfboards? I like to store 4 Windsurf Waveboards, the dimensions of the largest one is about 92x21". Also, how many arms does the rack have, for example, forhe 3 board version of this rack, is t 4 arms? One for each board plus an additionally arm = 3 spaces? This vertical surfboard rack could work for your windsurfboards. The height of your boards shouldn't be a problem, and the width - if the widest is about 22" inches - that shouldn't be a problem either; the rack's arms are about 16" long, but that length supports enough of the board's width to lean against, which normally is fine. And, yes, there is one extra arm for each rack, so if you order the 3 board version, you would have 4 arms to create 3 spaces for 3 boards, if you ordered the 4 board version, it would have 5 arms (creating 4 spaces. Love My Vertical Surfboard Rack! 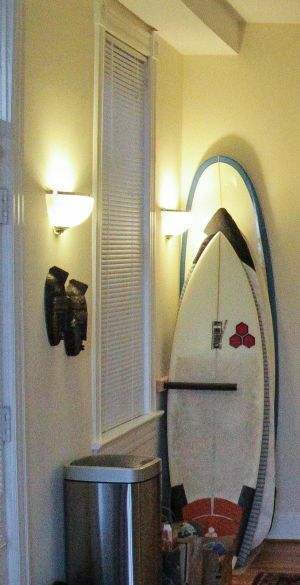 Super easy to install, great price, and looks like a mini-surfboard store in my living room! StoreYourBoard.com rocks, thanks for a great product! The rack itself is sturdy. I think it could use one more pre-drilled mounting hole in the center. Either that, or space the two holes 18" apart so that you can aim for the studs. Terrific, simple and easy to install wall rack. Product arrived pretty quickly and was easy to install. Solid build; easy install.Keeps 4 boards well-organized along the garage wall. The board storage rack is a good idea but a bit fragile. It would be better if it was metal. The rods could break off with a little pressure and almost happened when I put it up. I just recently bought this rack and it came out perfect. It was easy to install, strong materials, and it a great overall appearance. Nice system. Well constructed and easy to install. If I were to make any modifications I'd length the dowels 2 inches for long boards. That's just my opionion. They work and I'd buy another set. Really, I can't believe I paid $100 for this. While it does exactly what it says it will I have to say the quality of the wood (cheap white pine?) is less than spectacular. Not sure how long it will last, thin dowels, single screws. At half the price I might feel good. Didn't want to build my own, so I purchased this. It's clean and has pre-drilled holes for mounting, real east install into studs. I bought the 3 board rack and have 5 boards stored in it (4 shortboards and an 8 ft fs) :) Great purchase - looks sharp and organized. Sturdy, simple to install. Would highly recommend.